These rings belong to the Steampunk Collection. The left one features copper while the right one features brass. 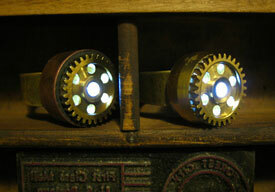 Justin Geer, the visionary behind The ArtistSandbox, summons the spirit of steampunk to craft his unique line of copper and brass LED NightLight rings. "I've always been fascinated with light," Geer admits. Geer graduated from the University of North Carolina at Wilmington with a Bachelor of Arts degree in theatre and currently lives outside of Atlanta. He is a man of many talents. As an actor who has appeared in the Vampire Diaries and largely focuses his talents in the independent film industry, Geer incorporated his copper rings as complementary gifts to the audiences at the private screenings of Pulse of the Indigo in Los Angeles and the Dominican Republic. And with each ring, he mingled in the bloody theme of the film with a bit of red paint at the corner-its adjustable band suited to fit any finger. From this, he realized the potential to customize rings with any theme for any occasion. In fact, he recently designed rings for post-apocalyptic fairy tale heroines between a group of women in character as Rapunzel, Ariel, Snow White, Red Riding Hood and Belle. 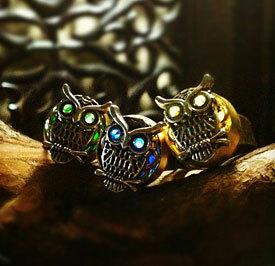 A skull, moth and dragonfly are just some examples of custom themes in the NightLight rings. He also sometimes adds an owl pendant to rings, with the light shining through the winged one's eyes. "As a former Eagle Scout, I really enjoyed playing in the woods-being alone and figuring out how things worked," Geer says. These rings use mostly brass casings, but copper can replace them, and mostly plated metal pieces are used to build the ring. These rings use colored gels to give the desired shade of eye color. "The casings are all brass or copper, and those go around the actual light," Geer explains. Geer puts sandpaper to use to scuff up the surfaces of his copper, adding etchings and markings to the metal before affixing the illumination angles of his work. The colors of the lights are determined by film gels used in movie productions or by the hues of glass stones he integrates. Gorgeously designed filigree bands in copper and brass join an antiquated lure to some of the rings. The steampunk style in many of them draws in a lot of web attention, helped in part by Geer's use of vintage brass stock car racing gears. "I love that there's functionality about it," Geer says about the lighting aspects of the rings. "I have women who buy a ring just so when they're in the car at night or in the theatre in the dark, they can use it to look through their purses." People who avidly participate in live action role-playing games, where old kingdoms might be set up in a forest, are one demographic where Geer has seen a lot of interest in his rings. A Swedish man recently bought a set of 10 for his team. Not initially expecting such strong international sales through his Etsy shop, Geer has had people from Australia, China, the U.K., Canada, Norway, Denmark and Singapore ordering his rings. "I really like the aesthetics of the metals," Geer says. "For me, they are a reminder of the Renaissance and capture a gothic feel."